Do you know what the biggest difference is between fear vs excitement? Listen in to this weeks podcast as I dive into these key emotions. Once you discover the difference and how your brain interprets these two emotions, you will never see life the same way! This could be just the ticket you have been looking for to achieve more success and happiness! This week’s podcast was inspired by Mel Robbins – One of my favorite speakers and author of The 5 Second Rule. One of the most eye-opening things I have learned from Mel is that fear and excitement have the exact same physiological representation in the body, the only difference is how we label them. Think about it. When you are afraid you may have chills, butterflies in your stomach, maybe you’re sweating a little bit, etc. When you are excited you have very similar physical reactions. What’s really interesting is that when people were told to be excited vs. scared during a test, the people who were excited performed better on the test. When you think about it, this makes a lot of sense. As entrepreneurs we spend 90% of our time outside of our comfort zones, in the place where fear lives. If we see this place as something to be afraid of, we’re not going to be as successful as we could be. It feels different to be excited in these moments rather than afraid. I want you to think about going through your day. Are you labeling the moments of your business with excitement or with fear? If you find you are afraid of certain things, try reframing them as something to be excited about. The thing I’ve realized is that nothing is permanent. Things change. Nothing is constant. The more you can approach your business as a journey, the better off you will be. Fear and excitement are similar, yet very different beasts when it comes to how your brain interprets them. When you can begin to approach all aspects of your business with a sense of excitement instead of fear, and you’ll be surprised at the effect this has on your business (and your life!). As always: Keep it simple, so you can grow. 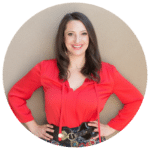 An entrepreneur, author, and strategist junkie dedicated to helping you build the business you want by making strategy and online simple! and get tips to grow your business straight to your inbox! Let's help you make things simple, so you can grow! 3 Ways to Grow Your Business, Your Revenue, and Your Impact Today! Ready to Create Lead Magnets Simply?